You have to hand it to Victor Mesa – the legitimate headline grabber of this year’s National Series baseball season. This truly has been “The Year of Matanzas” and “The Year of Victor Mesa.” Despaigne and Abreu chased a new home run record; an oddball and unprecedented tie-breaker-scenario tandem no-hitter spiced a season of record-book rewriting; Enriquito Diaz finally achieved his seemingly endless quest for a new base hits standard; and the capital city favorite Industriales club is back in the title hunt under rookie manager Lázaro Vargas, after an uncharacteristic off-season suffered during last year’s Golden Anniversary campaign. But the much-ballyhooed return of colorful Victor Mesa as the manager of usually hapless Matanzas has remained the talk of the Cuban baseball world ever since late last November, and the rather wild success saga of Victor and his upstart Crocodiles team just refuses to go away. 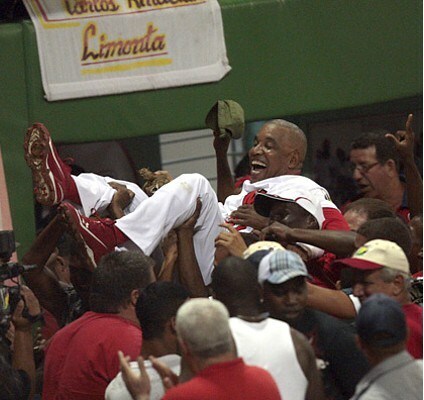 Victor enjoyed numerous managerial successes over the span covering his earlier 8-year reign (2002-2009) in Villa Clara. His National Series winning percentage (442-276, .616) ranks fifth all-time among managers with eight or more years of service, and only Jorge Fuentes (979), Higinio Vélez (623), and Eduardo Martin (548), won more regular-season league games. On three occasions Mesa guided his club into the championship finals. But on the whole his teams never seemed to do well in the post-season and his overall post-season record (36-42, .462) is one of only two sub-.500 playoff ledgers found among the five most successful National Series skippers (the other belongs to Eduardo Martin, who both preceded and followed Victor in Villa Clara). This notable dip in late-year playoff games may well have something to do with Mesa’s flamboyant and often controversial bench style – a style that most often calls more attention to the manager pulling the strings on the bench than to the players themselves on the field. Mesa inspires young athletes but seems to quickly wear out his welcome with seasoned veterans. But the commission’s decision to reinstate Mesa in Matanzas (rather than in Villa Clara), where diamond fortunes have bottomed out over the course of two decades since a one-time powerful team known as Henequeneros was rebranded as Matanzas – seems to have been a pure stroke of genius. Matanzas was already staffed with a wealth of young talent at the finish of National Series #50 and seemed ready to move up despite last year’s seventh-place Occidental League finish. Prospects like catcher Lázaro Herrera, infielder Yurisbel Gracial, outfielder Ariel Sánchez and pitcher Jorge Alberto Martinez (who missed all of last season due to injury) only needed to be instilled with a huge shot of confidence and shown how to win, and Victor seemed the ideal man for the job. This year the young Crocodile ball club raced to an early advantage, then barely hung on at the wire to achieve a first-time, first-place finish (and thus also a first-ever playoff appearance) for any squad bearing the name of Matanzas. And it now suddenly looks like Victor may also be perfectly poised to make his best post-season showing ever. Everything went pretty much as anticipated with the four opening-round quarterfinal series. If there were any mild surprises they were found in the ease with which Industriales handled the challenge from Cienfuegos, and also in the notion that Granma somehow managed to torpedo underachieving Villa Clara. The Industriales-Cienfuegos matchup was the only one that failed to last the distance, even though most pundits had likely seen that pair of second and third-place Occidental rivals as the most tightly matched clubs among the eight contenders. Despite the presence of Alfredo Despaigne and a strong contingent of supporting sluggers (mainly Yordanis Samón and Urmanis Guerra), the Granma Stallions boast the worse defense and the shoddiest backup pitching found anywhere in the league, and thus hardly seemed a good bet to survive any post-season series – especially one against Villa Clara, easily the league’s most balanced club all season long. Ciego de Avila and Matanzas escaped from the other two opening series just as expected, but it took surprising small “miracle” comebacks for both to survive. Industriales experienced few if any hurdles during the opening round and the renewed presence of the capital city team in the semifinals (after sitting on last year’s post-season sidelines) will now once again engage the bulk of Cuba’s rabid fan base. The Blue Lions were able to close down Cienfuegos even before the calendar turned a page into May and in the process assured themselves a lengthy and welcomed rest (eight days as it turns out) before having to face rival Matanzas. Mainstay right-hander Odrisamer Despaigne was the obvious pitching hero with his two solid outings: a complete-game four hitter in the lid-lifter and 7.2 shutout innings in Game 4. Veteran Cienfuegos southpaw Norberto González was on the losing end of both contests. Lions outfielder Yasmani Tomás upstaged Elephants slugger José Dariel Abreu with three round-trippers in the short five-game series. The only Cienfuegos triumph came in Game 2 at Latin American Stadium (by a 3-1 count) when the Elephants temporarily evened the series largely on the strength of a strong 7.1-inning, 3-hit shutout effort by starter Noelvis Entenza and some crafty bullpen work from reliable closer Duniel Ibarra. In Matanzas the Cinderella story continues, but only after Mesa rallied his club from the 3-1 hole they had dug themselves on the road in Sancti Spíritus. Not only did the Crocodiles have to crawl out of their deep pit with three straight victories, but they also had to finally get around Gallos ace Ismel Jiménez, who had already beaten them twice in the series and was gunning in Game 6 for a record-tying twentieth victory on the year. In short, it wasn’t quite as smooth as everyone expected in what had appeared at the outset to be the easiest matchup of the four to predict. The turning point seemed to come in a must-win Game 5 – the final home match for the eventual losers. One victory away from moving on to the semis, and coming off an 11-1 laugher behind Jiménez a day earlier, Sancti Spíritus bats fell silent against Jorge Alberto Martínez (8.1 innings of 3-hit shutout pitching). It was all downhill after that for a Matanzas club that crushed five Gallos hurlers 8-2 in Game 6 and then squeezed past Jiménez 4-3 in the wrap-up game. Granma provided the one small taste of upset seen so far in post-season 2012 and they did so by equally Ciego’s feat of taking two final must-win games on the road. Villa Clara looked like the league’s best team from November through April, and ironically Granma somehow managed to overcome the Orangemen more through heroics from their much-maligned pitching staff than from the exploits of their vaunted sluggers. Despaigne did provide three round-trippers in the series but none were struck during the final two critical games. Manager Indalecio Alejandrez’s Stallions benefitted most from outstanding bookend pitching performances by veteran Ciro Silvino Licea (Game 1 win, 1-0) and fast-developing fifth-year southpaw Leandro Martínez (Game 7 victory, 4-2). Licea’s gutsy opening-match 9-hitter erased an excellent complete-game effort by Freddie Asiel Alvarez for the Orange. In the finale Martínez upped his overall season’s mark to 12-4, only six victories shy of his entire previous four-year ledger. And in a pivotal fourth game that might have left Granma down 3-1 in the series, the Stallions prevailed (on the strength of a Despaigne homer) even though they committed several of the worst base-running blunders of the entire campaign. Ciego de Avila and Granma will now restage their semifinals clash of a year ago – won by the Tigers in six games. The two Occidental contenders didn’t even make it into the post-season a year ago and that fact perhaps puts the intangible element of recent post-season experience squarely on the side of the two Oriental clubs. Manager Roger Machado started out at a huge disadvantage in this one, but an assist from the weather suddenly turned things back his way. Machado was forced to use Vladimir García (his normal series opener) in the final match of the regular season (a must-win game in Cienfuegos for playoff qualification) and thus had to leave his ace on the sidelines until quarterfinal Game number three. That also meant two starts at the most for Garcia – last year’s semifinals hero. When he finally did appear Vlad rewarded with a brilliant complete-game effort that produced the Tigers’ first victory of the series. But earlier rain delays also meant that the ace righty could be brought back for crucial Game 6 (after Ciego had rallied in a final home game to cut the series deficit to 3-2). Garcia again worked eight masterful frames of a one-sided series-tying 12-2 victory. In the decider on the road Yander Guevara (only a .500-level hurler for the entire season) essayed a brilliant complete-game 4-hit effort the kept Machado and Ciego squarely in the heart of championship contention. Industriales, with its first-series momentum, huge fan base, and relatively deep pitching, now looks to be in the driver’s seat. But Matanzas seems to have Destiny on its side – and also Victor Mesda, a factor that might yet tip the balance in either direction. Granma with its porous defense and penchant for sloppy efforts on the base paths is the one team that likely won’t hang around for very long. More than anything it appears that Ciego – back from the dead in Las Tunas – is now well positioned to be the true “dark horse” (and even the gambler’s favorite) in this complex race. My bet is that Matanzas will win out over Industriales in six games – mainly on the often overstressed strength of the home field advantage. Ciego should also edge past Granma, although the Stallions have enough offense to drag that series out to a full program of seven games. What may well be emerging piece-by-piece is a glamorous final-round faceoff between two of Cuba’s most controversial managers and also between two teams that have never before won a league title. If it happens it would in fact be the very first such title clash between first-time hopefuls. Victor Mesa has his many critics who think that his bench antics (which have already led to one five-game suspension this season) detract from the on-field spectacle. Roger Machado is less than popular with most observers and commentators in the Cuban media who think he badly mishandles his frontline pitching (appearing to have little faith in his starters outside of ace righty Vladimir García). Both criticisms are largely unfair: if Victor is colorful he also usually gets the best out of his players; and Roger has reason enough to rely on the best arm in his arsenal. A clash between these two crafty bench bosses would certainly provide one of the most entertaining Cuban League finals in many years. But of course we have a long way to go yet before we get there. I realize this question really doesn’t deal with this entry in particular, but do you think it will be anytime in the next few decades that Cuban baseball players are allowed to play elsewhere? As a fan of Granma, I only hope that Mr. Bjarkman’s predictions about my team are as accurate as when he predicted that Yuniesky Maya would outpitch Aroldis Chapman in the MLB. That is all I ask for.